1. 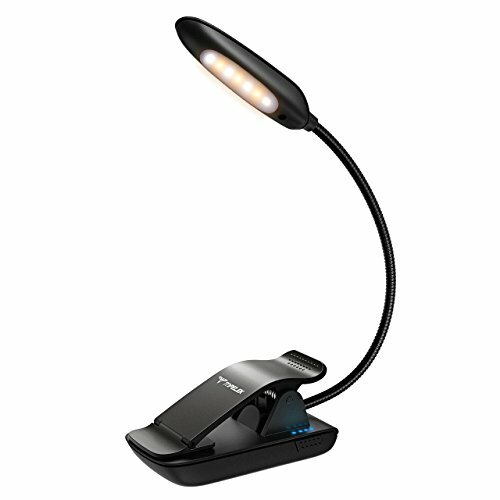 Eye Friendly LED Lamp: eye-protection and energy-saving reading light, stable light source without flickering or dazzling, protects your vision and reduces eye fatigue. 2. Metal Goose Neck: Ultra-flexible metal goose neck can bend and twist in any direction for the best light angle in low-light or dark/night situation. Metal made goose neck is more durable than common silicone made goose neck. It ensures longer longevity of the lamp. 3. Adjustable Clip with Anti-Skid Material: The adjustable clip can fit different kinds of books, computers and shelves. While the anti-skid pad keeps a firm grip on the object without scratching it. 1. One-key Control: easy to operate, one key to turn on/off the lamp and choose different modes. 2. LED Power Indicator: The LED power indicator and the key are on the side of the lamp. Click to check remaining power when the lamp is not charging. 3. Brightness Setting: with 9 brightness options. Short press to control brightness level, long press to control color temperature. 1. Strict quality test for products, no tolerance on poor quality. 2. Carefully selected materials ensure the long service time of the lamp. 3. Electricity protections: include overheat protection, abnormal voltage protection, short-circuit protection, etc. Those protections keep the lamp in normal work condition and avoid the risk of fire. Every TopElek product includes a 45 days money back & 18-month warranty. 【All-purpose Book Light】Small in size but rich in functions, for both home and on-the-go use, ideal assistant for kindle, computer, reading, sewing, making up. 【9 Modes】3 color temperatures(3000K to 6500K) x 3 brightness settings(Low,Medium,High ), 9 modes in total. Long press to control color temperature, short press to control brightness. Easy to switch, satisfying your different light demands in daily life. 【Rechargeable Battery with Power Indicator】Built-in 1000mAh battery provides up to 60 hours lighting time. It only takes about 1.5 hours to quickly recharge. With battery indicator, it is easily to know the remaining power and arrange your reading time. 【Eye-protection LED Source】No flicker, no shadow, no dizzy light. LED lamps provide more stable and comfortable light than common incandescent lamps, protecting your eyes from shining hurt and radiation. 【Light Weight and Portable】This new book light is 3 oz, perfect for nighttime reading in bed and for travel with portable bag. [NOTE]TopElek provides a 45-day money back and 18-month worry-free! If you have any questions about this product by TopElek, contact us by completing and submitting the form below. If you are looking for a specif part number, please include it with your message.